A data lake is a centralized repository that allows you to store all your structured and unstructured data at any scale. You can store your data as-is, without having to first structure the data, and run different types of analytics—from dashboards and visualizations to big data processing, real-time analytics, and machine learning to guide better decisions. 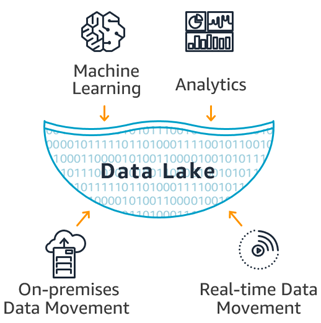 Data Lakes allow you to store relational data like operational databases and data from line of business applications, and non-relational data like mobile apps, IoT devices, and social media. They also give you the ability to understand what data is in the lake through crawling, cataloging, and indexing of data. Finally, data must be secured to ensure your data assets are protected. A Data Lake can combine customer data from a CRM platform with social media analytics, a marketing platform that includes buying history, and incident tickets to empower the business to understand the most profitable customer cohort, the cause of customer churn, and the promotions or rewards that will increase loyalty.